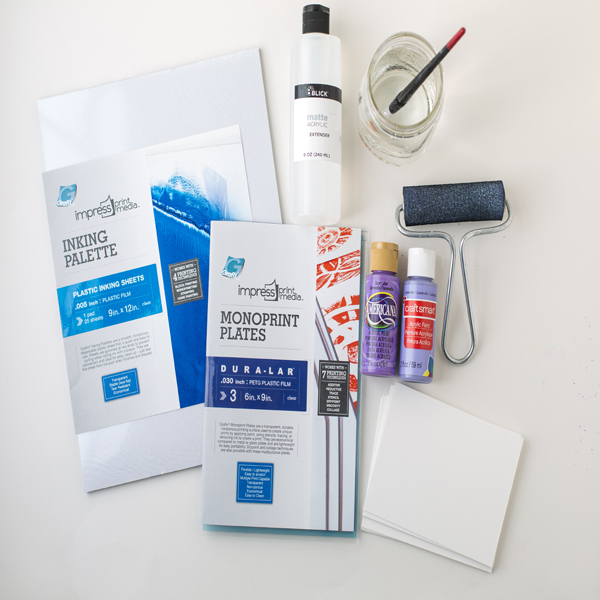 Project Description: Monoprinting is an easy, fun, and addictive (!) technique for creating unique images. 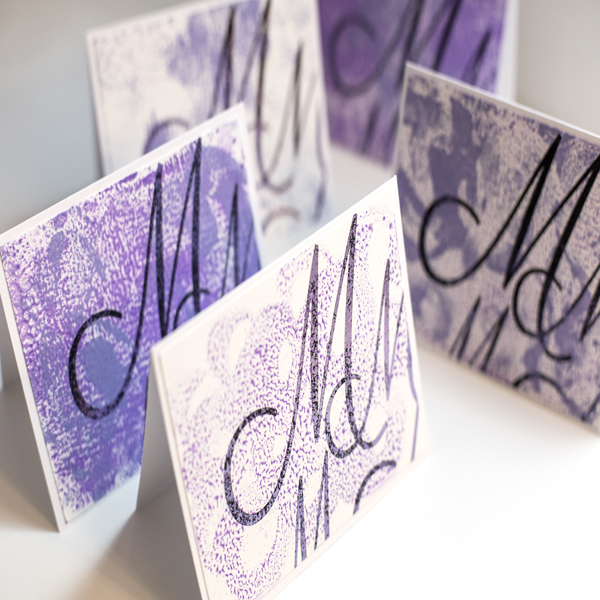 Create a set of one-of-a-kind monogrammed notecards that each feature a monoprinted background. 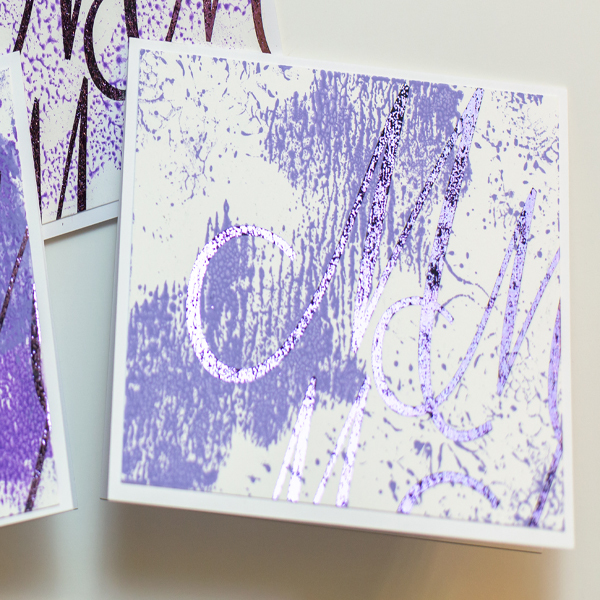 Lilac foil adds a modern touch to enlarged script initials. 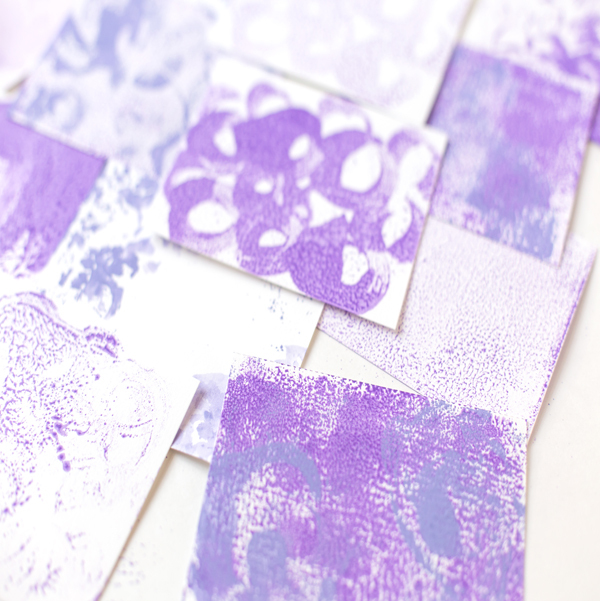 Cut several sheets of printmaking paper to 4” x 5 ¼”. Cut several more than you need for the final set of notecards as you will want to choose your favorites (and this technique is addictive… you will want to have extras to experiment with). Squirt a teaspoon of each color paint onto palette and add ½ teaspoon of extender; mix well. 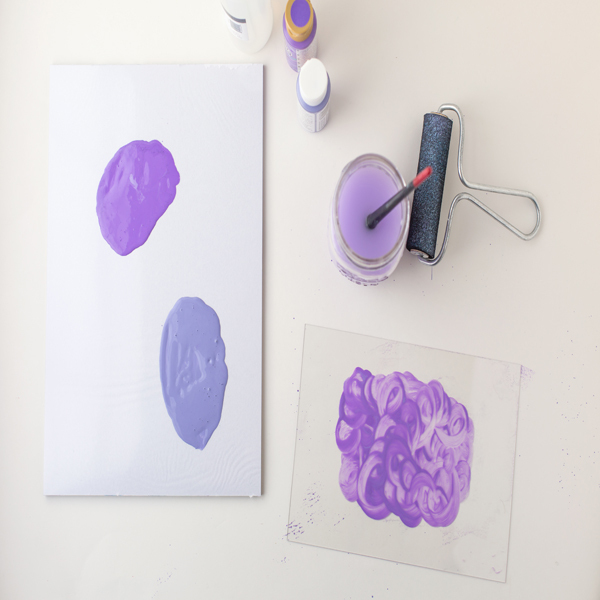 Apply paint to a monoprint plate in any pattern and mix of color desired. 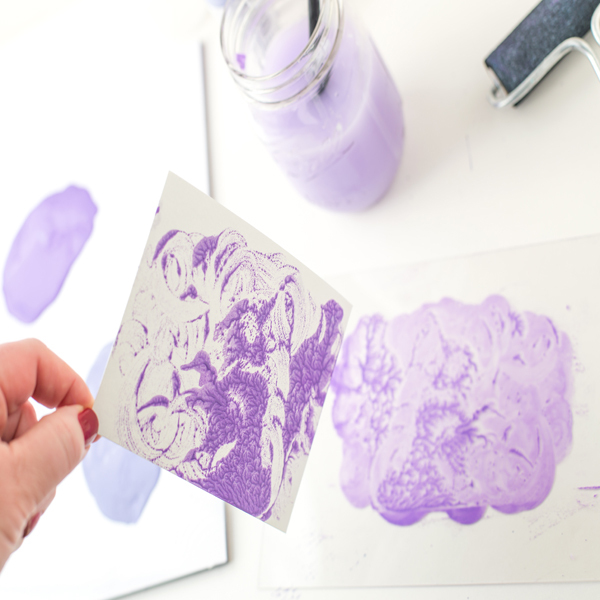 Press paper onto plate and rub with a brayer or your hands. 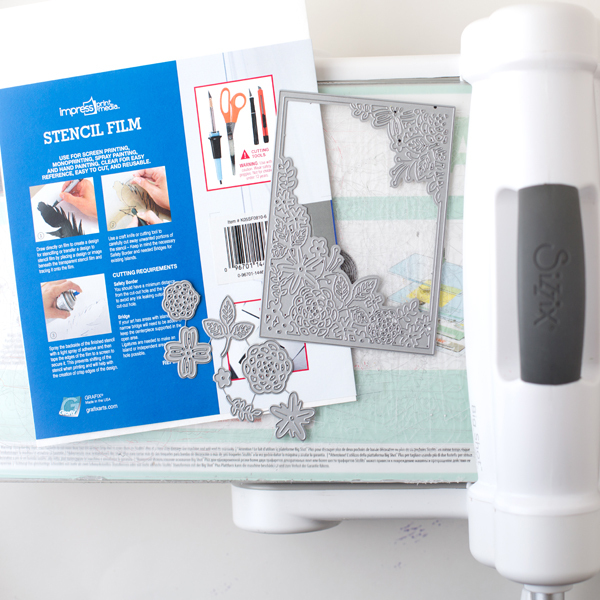 Carefully peel up print and allow to dry. Repeat with a second piece of paper. If you work quickly you should be able to get at least two prints from each application of paint. The second print will be much lighter than the first. It is interesting to see the variety of designs created simply by moving paint over a smooth surface. 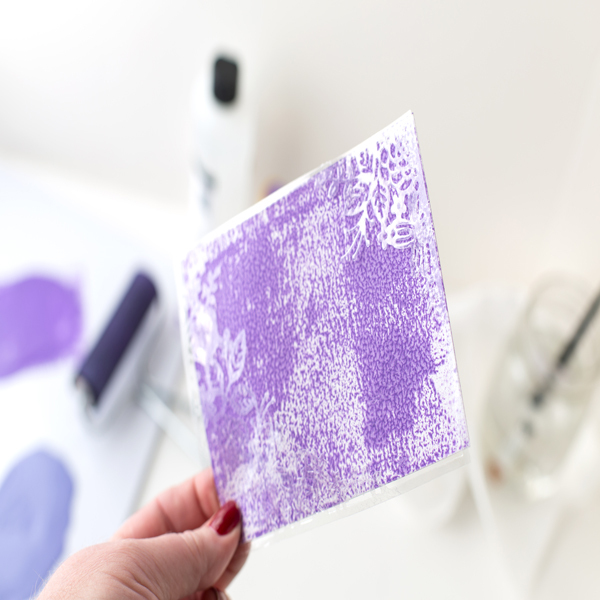 To add even more interest to your monoprint, die cut shapes from Stencil Film and place between paper and plate. Try printing in one color, letting paper dry, and then printing with a second (or even third) color. The sky is the limit when creating monoprints and the beauty of them is that they are so quick and easy to create, yet give such interesting and unique results. Once you have a selection of prints, choose 4-6 of your favorites to use for the notecard set. Print a large script initial in a random pattern directly onto the print using a toner based printer (or bring to an office supply store and ask them to print for you). Follow manufacturer’s instructions to apply foil in a coordinating color. The texture of the paper will show through creating a distressed metallic effect on the monogram. Apply the foiled prints to the front of white cards cut to 4 ¼” x 5 ½”. 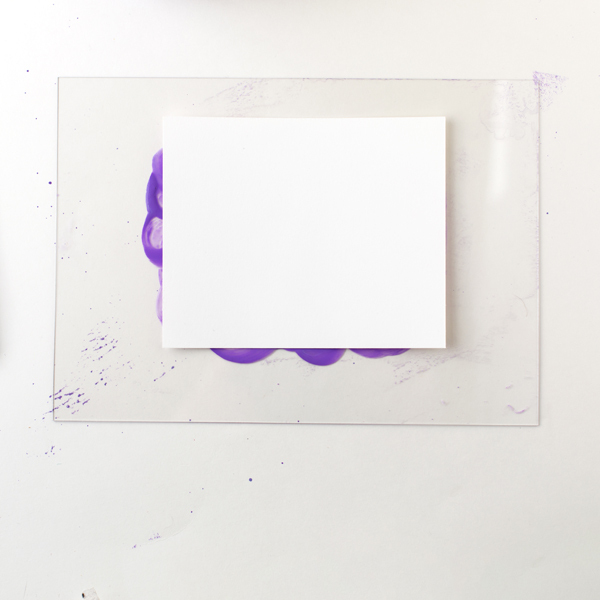 TIP: Create a set of matching envelopes by pressing the edge of plain white envelopes into leftover paint on the monoprinting plates.